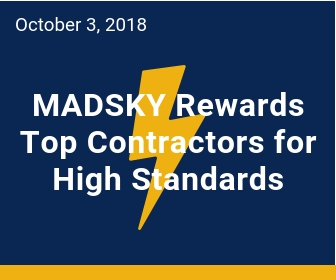 ENGLEWOOD, Colo., October 3, 2018 (Newswire) - For members of the MADSKY Preferred Contractor Network that consistently uphold and often exceed the expectations set for them, MADSKY awards Lightning Preferred Status. Through measured success, defined by benchmarks tracked through MADSKY’s customized software, earning Lightning Preferred Status affords many more opportunities for the contractor such as first priority on leads, higher profit margins, and special offers. Through rewarding hard work and commitment to policyholders, MADSKY partners with Contractors that define their companies by these standards. One example is Xcel Roofing, based in Nebraska. Their company has grown into seven markets in 5 states, demonstrating an overwhelming closing rate of 65-70%. MADSKY offers its contractors many opportunities to grow their business as well as access to national supplier discounts to help keep overhead costs at bay. The Preferred Contractor Network is screened and vetted through a customized process that includes background checks, reputability reports, and proven history of excellence. Once invited into the program, contractors receive assignments directly from carriers, and the opportunities for new revenue growth from there. Contractors are assigned to local inspections and build relationships with surrounding homeowners which leads to retail opportunities. Contractors are expected to be on time, professional, and complete, thorough inspections while assisting the policyholder through MADSKY’s Frictionless Customer Experience (FCX). Each relationship between MADSKY, the Contractor, the policyholder, and the Carrier, is unique with different Service Level Agreements where-in Contractors are challenged with the task of speed and efficiency combined with workmanship and high-level customer service. The MADSKY Lightning Preferred Contractor Benefits program was designed to reward the members of the MADSKY Preferred Contractor Network for going above and beyond the expectations set forth for them.